Grauman's Chinese Theatre Grauman's Chinese Theatre is a movie theater located in Hollywood. It is located along the historic Hollywood Walk of Fame. 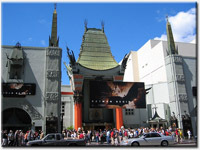 The Chinese Theatre was commissioned following the success of the nearby Grauman's Egyptian Theatre which opened in 1922.